The hockey lover on your gift list is sure to enjoy watching the Griffins take on the Rockford IceHogs. 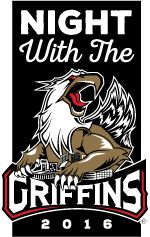 It’s LMCU’s 2016 Night with the Griffins on Saturday, February 6, 7:00 p.m. at the VanAndel Area. Tickets are $13 for upper bowl seats, and $17 for lower bowl. Each game ticket also includes a free $3 food voucher and a free LMCU Griffins t-shirt. Tickets on sale starting November 23 at all LMCU branches!